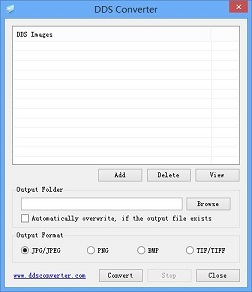 DDS Converter is a free image converter for DirectDraw Surface (DDS) image files, it can help you to easily convert DDS images to other common image formats, such as JPG/JPEG, BMP, PNG and TIF/TIFF format. It can support batch conversion. In addition, this software also provides DDS image viewing function, before you begin the conversion, you can open and view the image content, that is to say, you can use it as a DDS image viewer. Freeware, free for non-commercial and personal use. Work with Windows 8, Windows 7, Windows Vista and Windows XP (.Net Framework Required). The usage is very simple, you can use "Add" button to choice DDS files, software can support multi-selection, at one time you can add multiple files. By using "View" button, you can quickly preview selected image. After you have completed file selection, you can input an output folder to store all generated files. Then you should set your a output image format, the default output format is JPG format. Finally, you can hit "Convert" button to start the conversion. DDS is the abbreviation of DirectDraw Surface, it is a image compression format (DirectX Texture Compression, referred DXTC). There are three kinds DXTC formats available, includes DXT1, DXT3 and DXT5. Now, this format is widely supported by the majority of 3D graphics hardware, and be used in many 3D software and 3D games. Copyright © 2013 DDSCONVERTER.COM, All Rights Reserved.